I was first licensed in 1967 as WN5SZC. In 1969 I became WA5WWH and I hold an Amateur Extra class license with callsign K5XG. A native Texan, I was born and grew up in Dallas where I graduated from High School in 1970. I then attended Southern Methodist University (SMU). In 1974 my professional career began and for the past 40+ years I have been involved in the telecommunications and online industries including computer system development, amateur radio, commercial two-way radio, AM commercial broadcasting, telephone answering service, radio paging, central station alarm monitoring, radio dispatching, and as an Internet Service Provider (ISP). I have for most of my life enjoyed giving back through public service. Be it in amateur radio, church, school, the community, dog rescue, or scouting where I achieved the rank of Eagle Scout and earned my God and Country award. ARRL life member since 1976. In 1968 I joined the ARRL after receiving my novice ticket. 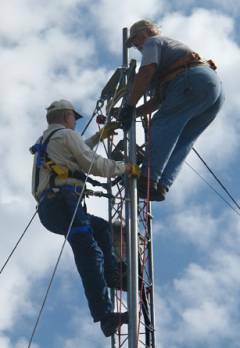 Over the years I have taught amateur radio classes in my home, tower climbing seminars, and I present technical programs at local area radio clubs. In 2010 I successfully championed a new PRB-1 compliant tower ordinance for the city of Lucas, Texas. 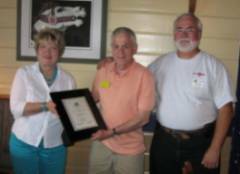 I am a member of several local amateur radio clubs in the DFW area. I have served my community as a member of the Planning & Zoning Commission where I helped to protect our current amateur radio tower ordinance. I also served a two year term on the city of Lucas' Board of Adjustments. I have embraced almost every facet of amateur radio. I have experience in design, development, construction, installation, field work, classroom instruction, mentoring, and damage assessment. If its RF, I have designed it, planned for it, built it, read it, wrote it, talked on it, listen to it, touched it, tuned it, tested it, fixed it, installed it, removed it, or cried over it at some time during my 47 year love affair with amateur radio. Decades ago I took an oath to help strengthen America, to help others, and to seek truth and fairness. I maintain a personal sense of honor. I treasure my American heritage and will do all I can to preserve and enrich it. I will for the rest of my life teach what I have learned to help others and I will lead the way by example. My Door is Always Open for You. It may have been an episode of Science Fiction Theater, an Andy Hardy Movie where they are trying to contact a far off station in Brigham Canada, an episode of Donna Reed where they were using CB walkie-talkies, an exciting chapter in a Tom Swift Jr. or Hardy Boys book, or some other �Gee Whiz� moment on television or in life. What I do know is that on the first day at a new junior high school I was trying to find a group during lunch in which I would �fit� and as I was walking around the lunch room I over heard someone commenting on ham radio and I jumped into that group. I asked to go home with the new friend that day to see his Amateur Radio station. We walked into his bedroom and sitting on his dresser was a Collins S-Line. I was SOLD ! That new friend was Hugh Grandstaff, former WA5PFP. All things happen for a reason and this was no different. I started going home with Hugh every day after school and he would help me with the theory for the Novice license test and give me code practice. A few days later Hugh says that he had a �schedule� with an old friend of mine ! It turns out to be with Sam Barricklow, now K5KJ. Sam and I have known each other since we were five. We went to grade school together and after I moved and switched schools I didn�t think I would ever see him again. Our friendship continues to today thanks to amateur radio. Sam would be the best man in my wedding and I talk to and see him almost weekly. Amateur radio put us back together and has kept our friendship strong. Sam and I, being two young teenagers in the 1960s, did some wild and crazy things in amateur radio. It turns out to have been a good thing as we tried about everything we could think of for an antenna and we didn�t let those �nay sayers� stop us from experimenting. We both still carry on today the testing of new antenna ideas. Sam and I made other long term and strong friendships with other hams back in our teenage days. 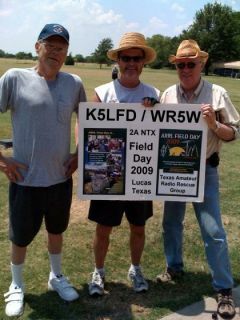 Pete Beadling, now K5OU, Jim Eppright, now K5RX, and a few years later Gordon Fogg, now N5AU. All successful professionals and all still active in various aspects of amateur radio. A lifetime of amateur radio knowledge is in these men and they are all willing, if not eager, to share their experiences with you.